This is the model that’s often the first RV many people own. It’s seen as a practical step-up vehicle to make that jump from a tent to an RV. A fold-down is lightweight and towable by many smaller family vehicles, and it can be inexpensive to buy and fairly easy to store. Although it may seem complicated at first, once a family has a couple of practice setup-and-breakdown sessions, getting the trailer ready for use can be a fun, painless process. 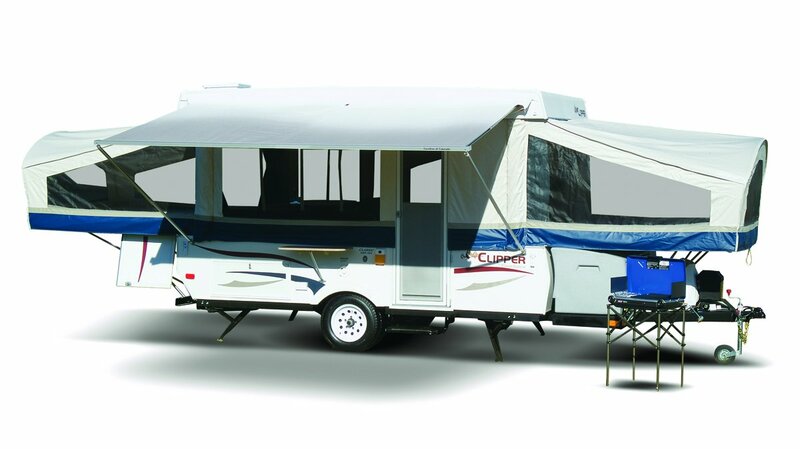 Camping in a tent trailer is much like camping in a tent in that the fabric sidewalls provide minimal sound or temperature insulation; however, they also let you enjoy the ambiance of the outdoors. You sleep on a mattress, are surrounded by bug screens, and have a modest amount of protection from nosy wildlife. A furnace and/or air conditioner are often available for a fold-down to minimize the effect of the sketchy insulation. Lower-cost fold-downs are short on amenities, such as a refrigerator, demand water system or built-in toilet, but they’d usually include storage for a portable toilet and a hand-pump faucet at the sink. Higher-end models are fully equipped and may even include fold-down interior hard walls to isolate the shower/bathroom area, for example.